Sustainable design can be boiled down to a handful of issues. We can reuse what we already have. Or we can learn to keep our new purchases for longer. We can also choose to accept the disposable nature of contemporary consumption and invest in objects designed for a short life. The first approach addresses the waste we have already created. The second hopes to reduce future waste by extending an object’s useful life. The third tackles waste, not by expecting us to consume any less, but by using materials that were never intended to last forever. Three British designers embody these three very different approaches to the sustainable design dilemma. Lucy Renshaw recycles existing materials to create products for the home. 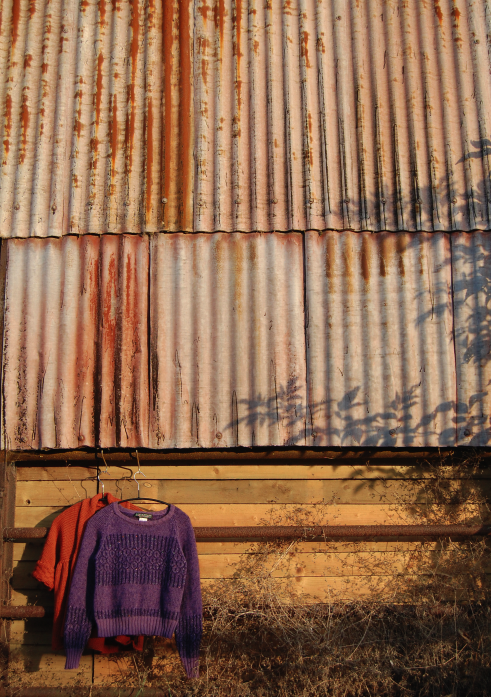 Amy Twigger Holroyd of Keep and Share encourages a long-term commitment to her knitted garments. Suzanne Lee’s Biocouture project creates ‘grown’ fabrics destined for the compost heap at the end of their lives. At one end of the spectrum is a desire to accept and even enjoy the wear and tear that builds up on the material world around us. At the other is an acknowledgement of the fickle nature of twenty-first century consumption. When Lucy Renshaw graduated from the Mixed Media Textiles course at the Royal College of Art in 2006 she set up a business that allowed her to continue “collecting junk”. “I would rather root around bags of fabric than buy new,” she explains. Renshaw’s ‘accidental’ image as a sustainable designer is not an uncommon, or unpleasant, predicament that many textile designers find themselves in today. Davina Hawthorne and Alison Willoughby have both noted a similar relationship to recycling, borne first out of a desire to work with unusual materials that then led to recycling. “I’ve always worked this way,” Renshaw explains, “but lately it has become more helpful to mention it when marketing my work.” Renshaw creates products for the interiors market, but it is often the objects she finds that direct the work she produces. Fabric, furniture and lampshades are sourced from the British equivalents of yard sales: “car boot sales, jumble sales and scrap shops”. With her business established, donations from friends and family also make up a significant amount of the raw material that finds its way into her studio. Amy Twigger Holroyd is equally committed to sustainable design, but her approach couldn’t be more different. 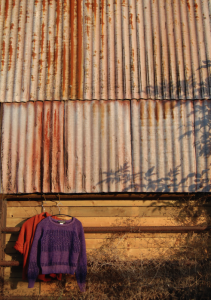 Her knitwear company Keep and Share places an emphasis on long-term ownership rather than recycled materials. The business was conceived as an ‘alternative luxury’ knitwear label during Holroyd’s MA at Winchester School of Art in 2003 and launched in 2004. Considering that waste is a primary contributor to the pollution the textile and fashion industries are responsible for creating, her approach makes sound sense. Keep and Share works to instill the same sense of commitment we might have for a family heirloom into the new garments it creates. The business provides trial and swap offers as well as hand washing, makeover and mending services. The idea is that each of these gestures helps to remind the buyer that their purchase deserves long-term use. The seamless construction methods Holroyd uses have allowed her to “develop techniques for joining and gathering pieces seamlessly using domestic knitting machines.” This keeps production local, rather than outsourcing complex production to industrial equipment. Rather than a static shop on the high street the company is an online presence as well as a traveling shop that pops up at music and literary festivals. Recently the traveling shop has become a workshop as well, encouraging passers-by to try their hand at knitting and perhaps experience a new found appreciation of the craft. The company now markets patterns and materials to hand knitters so that construction of Keep and Share designs can belong to the maker. Inviting others to participate in production provides yet another route to fostering emotional ties with our garments. Suzanne Lee’s Biocouture project tackles yet another approach: accept that consumers will always be fickle. Cope with this problem through the use of new materials that generate minimal environmental impact when discarded. As a Senior Research Fellow at Central Saint Martins College of Art and Design, Lee has been experimenting with the development of cellulousic fibres that can be grown into sheets of material. When dried the substance has the consistency of tyvek or thick paper and can be cut, sewn and dyed. At the end of Biocouture’s life it can go on the compost heap and biodegrade alongside your vegetables. Lee explains that paper has long been used as clothing. In Japan, for example, paper was used for workers clothing, then by samurai and then, in a seeming contradiction, as protective clothing for firemen. Her current research continues to explore the viability of these grown materials. A wooden dress form has been made to allow the material to dry and create a stitch-less three-dimensional garment form and Lee is experimenting with natural dyes and recipes to maintain the flexibility of the material. She now sees product rather than fashion design as potentially more suited to the material’s attributes. “The challenge is to make it work and I don’t have skills to do that on my own.” Funding to support collaborative research between the sciences and the arts is Biocouture’s next step. Lee is firm about her final vision. “I don’t want to create gallery oddities,” she explains. In spite of their differences, this sense of pragmatism, combined with remarkable ambition, is a vision shared by these three extraordinary designers.